Hozier is an Irish singer and songwriter, who has gained a lot of attention after releasing his single “Take Me To Church”. The song tackles the problem of homophobia and has a music video that complements the lyrical content. No need to mention, that the song affected a lot of people around the world and became very popular. Tutorial for beginner piano players. It’s also a great example to learn on the piano, even if you are a beginner. 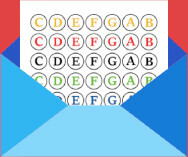 With the letter notes, that we have prepared for you, you’ll be able to learn the song in less than an hour! Just follow the letter notes and match them to the keys on your keyboard. If you want to learn more emotional music, make sure to check out our “Let Her Go” and “See You Again” tutorials.